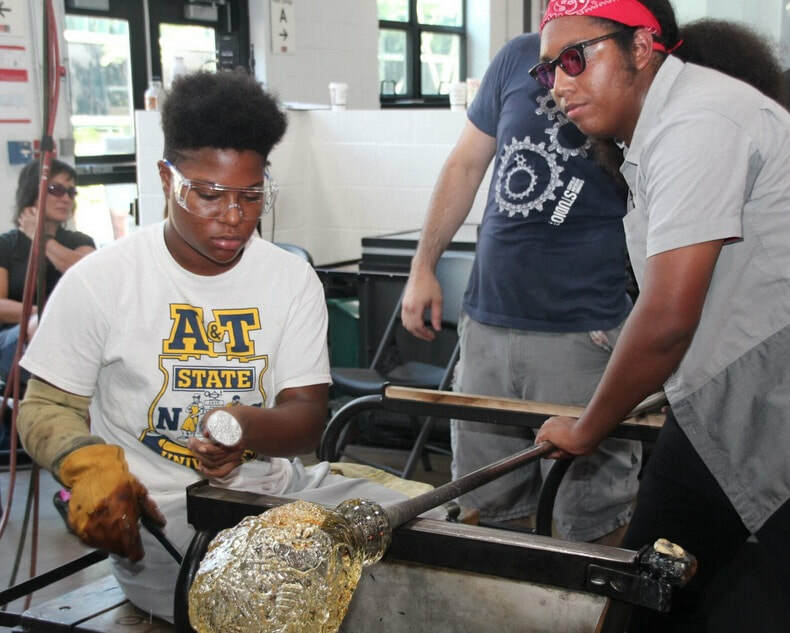 Scenes from the 2018 Expanding Horizons program where The Corning Museum of Glass opened its Studio, Amphitheater, Rakow Library, and Contemporary Art + Design Wing to Jalen Pittman and Ivynise Velez (from the Ignition Program at Ignite Glass in Chicago); Julian Brundidge and Trevelli Jones (from the Firehouse Art Studio in Chicago); Dominique Baldwin (from Hilltop Artists in Tacoma, Washington); and Jamia Johnson (from Little Black Pearl in Chicago). The Robert M. Minkoff Foundation would like to thank the generosity of the Corning team for their time and resources in making the 2018 edition of Expanding Horizons such a success. The 2016 Expanding Horizons participants. Since 2015, educational outreach programs around the country that offer glass courses to underserved youth nominate their most-talented students to take part in the "Expanding Horizons" program, a four-year-old partnership between The Corning Museum of Glass Studio and the Robert M. Minkoff Foundation. From Ignite Glass in Chicago: Jalen Pittman will be accompanied by his mentor, Joe Waropay, and Ivynise Velez will attend with her her mentor, Kit Skinner. From Hilltop Artists in Tacoma, Washington: Dominique Baldwin will attend with her mentor, Jessica Hogan. From Little Black Pearl in Chicago: Jamia Johnson will attend with mentor Alex Kruger. The Minkoff Foundation is grateful to all the Studio staff for their support and assistance in making "Expanding Horizons" possible. The Robert Minkoff Foundation continues its ongoing support as a lead sponsor of the important work of Housing Unlimited, an innovative nonprofit which provides affordable housing for individuals struggling to overcome mental health challenges. Independent living and community opportunities have been the key to this successful program changing lives in Montgomery County, Maryland. More information on this important partnership. The Museum of American Glass at WheatonArts has reopened with the exhibit “Beauty Beyond Nature: The Glass Art of Paul Stankard.” This exhibition, organized by the Robert M. Minkoff Foundation, celebrates the botanical sculptures, evolution and major developments of American Master, Paul Stankard – drawing from his first attempts at creating a paperweight to showcasing his most complex orbs. Now open, the exhibition will run through December 30, 2018. Collector Robert Minkoff assembled this definitive collection of Stankard’s, which has been exhibited at the Museum of Glass in Tacoma, Washington, the Bergstrom-Mahler Museum of Glass in Neenah, Wisconsin, and the Lowe Art Museum in Coral Gables, Florida. The exhibition is accompanied by a book of the same name. Lavishly illustrated with detailed photographs that capture never-before-seen levels of detail that bring Stankard’s technical and expressive achievements to life, the book is a perfect accompaniment to this unique exhibition. More info on the exhibition. Offering talented high-school-student artists from under-served communities the opportunity to experience glass art at a new level, the Expanding Horizons program will return in 2018 for another week-long opportunity for the top high-school-aged students in after-school glass-art programs around the U.S. to experience the wide world of glass art in depth. 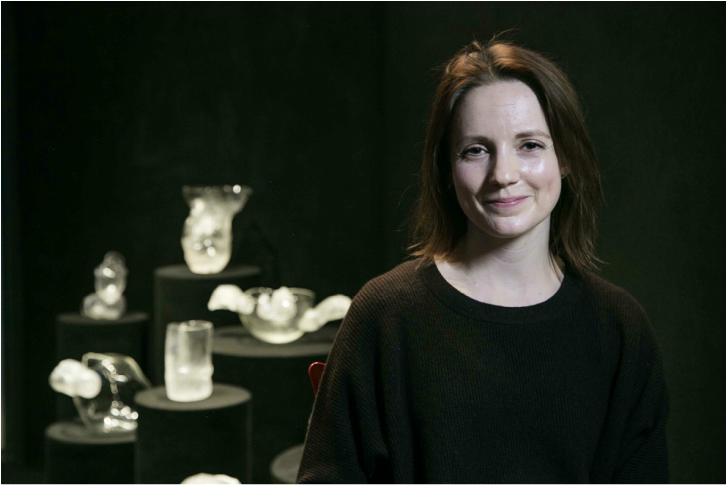 Taking place at the Studio of The Corning Museum of Glass from August 6 to August 11, 2018, the program blends instruction at the state-of-the-art studio facilities with curator-led tours of the world's leading glass collections, meetings with head researchers at the Rakow Library, an informational session with the chief buyer from The Corning Museum store, a presentation on applying to colleges with a focus on glassblowing, and much more. Designed to provide opportunities for students with financial need, the program covers students' travel and lodging expenses, and is offered free of charge to the selected applicants. For more information, or to apply, please visit www.atriskglass.org/outreach. The deadline for applications is March 31, 2018. The full 12-page program booklet for the 2017 Robert M. Minkoff Foundation Academic Symposium at UrbanGlass can now be downloaded as a PDF. 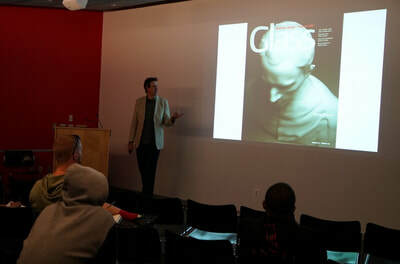 Highlights include a keynote presentation by Rachel Berwick, head of the RISD Glass program; results of the first-ever survey of compensation in the glass field by Helen Lee, head of the glass program at UWisconsin, Madison; an international panel of professors from around the world; and many more thought-provoking takes of this year's symposium theme: "Curriculum and Career." All this plus a gallery tour on Manhattan's Lower East Side, a performance/happening by Flock the Optic, and much more. The Expanding Horizons program seeks to advance the knowledge of underserved youth and their mentors about the wider world of glass art. 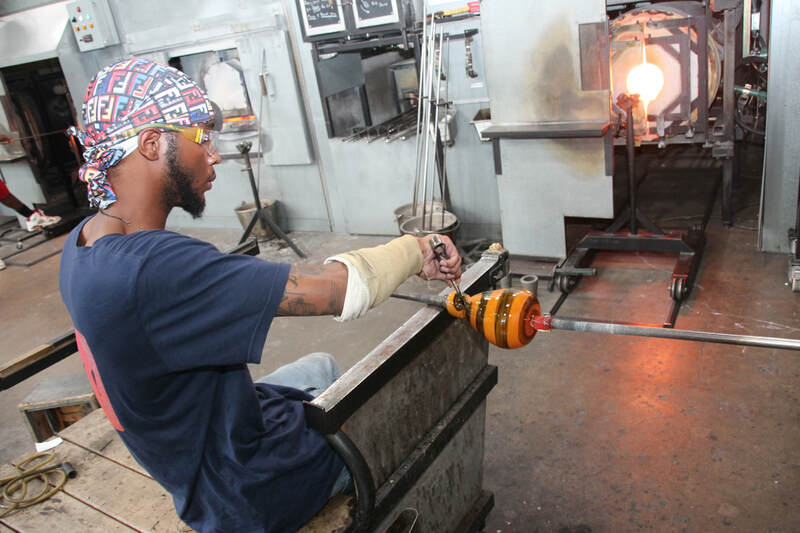 A partnership with the world-class Corning Museum of Glass, it offers six students in glass programs around the U.S. the chance to travel, expenses paid, to the leading museum of glass for a week of experiences. These range from curator-led tours of the museum's holdings to lectures by the retail buyer at the Glass Market, one of the leading outlets for glass in the world. 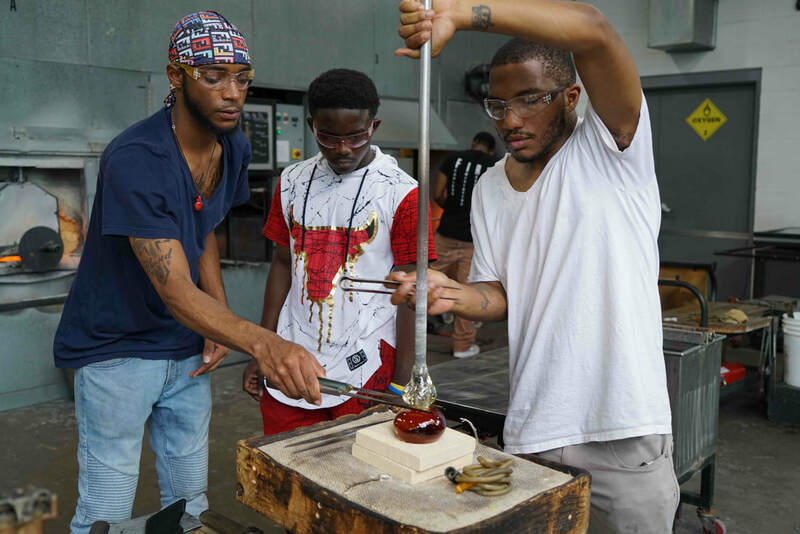 In addition to educational and research experiences, the program also seeks to build bonds between the students and mentors of different programs, encouraging a dialogue in the language of glass. 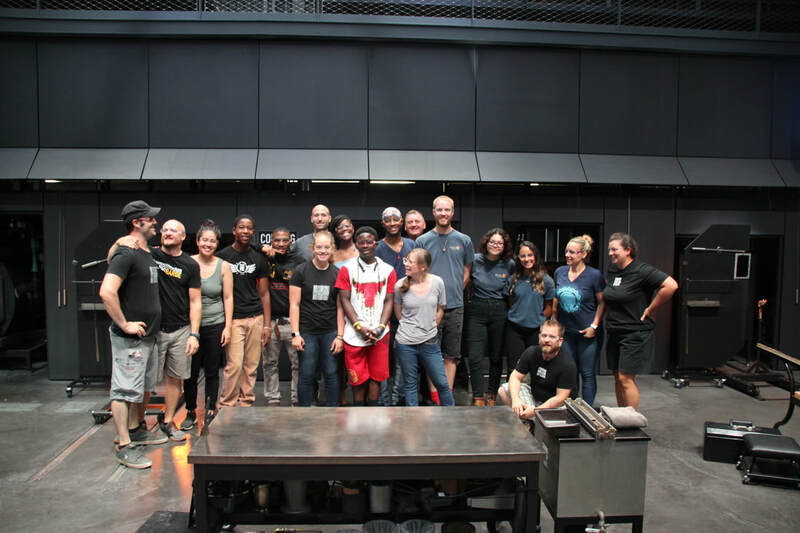 The Minkoff Foundation offers its congratulations to the participants in the 2017 Expanding Horizons Program, which took place from July 2nd through July 9th at the Corning Studio and Museum. Pictured below, left to right: Mentor Mark Morris with Student Jeremiah Brown from YAYA, New Orleans; Student Dantrell Blake with Mentor Alex Krueger from Project Fire, Chicago; Student Santiago Aquilera with Mentor Josh Laabs from Ignite, Chicago; Student Nia Fairley with Mentor Joe Waropay from Ignite, Chicago; Student Taquita Pendelton with Mentor Tracy Kirchmann from After School Matters Program, Chicago; and Student Tanner Martin with Mentor Trenton Quicho from Hilltop, Tacoma. 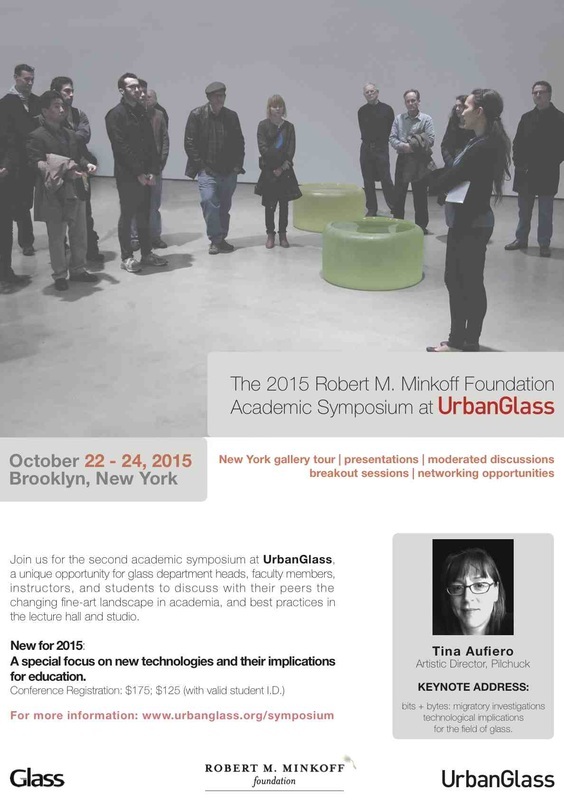 Rachel Berwick, head of RISD Glass, will deliver keynote address at 2017 Robert M. Minkoff Foundation Academic Symposium at UrbanGlasss, "Issues in Glass Pedagogy: Curriculum and Career"
Artist Rachel Berwick, the head of the Rhode Island School of Design's glass department, will deliver the keynote lecture at the 2017 Robert M. Minkoff Foundation Academic Symposium at UrbanGlass this fall. Berwick's presentation, entitled "Alchemy: Innovation and Experimentation in Studio Practice," will lead off the third iteration of this biennial academic symposium set to take place from October 12 -14, 2017 in New York City. 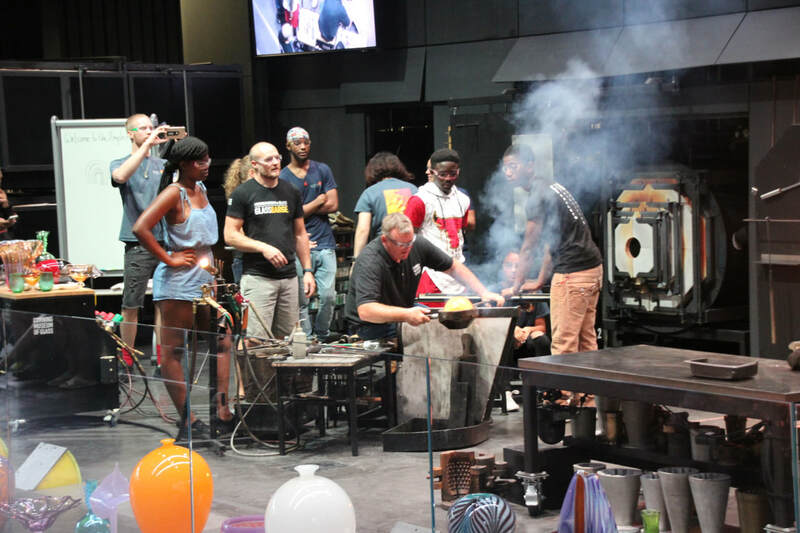 With the theme of "Issues in Glass Pedagogy: Curriculum and Career," the international gathering of glass educators will examine the factors that determine students' post-graduate success through a program of lectures, panel discussions, and demonstrations. Click here to purchase tickets, or learn more. The third biannual gathering of glass educators will take place on October 12th, 13th, and 14th, 2017. As in year's past, the event will kick off with a New York gallery tour, visiting exhibitions presenting glass in a contemporary art context. 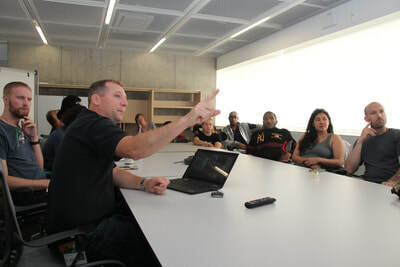 The second day will take place at St. Francis College's state-of-the-art lecture hall, where presentations and panels will be delivered. The third day of the event will take place at the studios of UrbanGlass, where live demonstrations, discussions of best pedagogical practices, will be presented alongside lively group discussions. More information on ticket sales and travel arrangements will be announced shortly. For now, save the date! At the 2015 symposium, Helen Lee, head of glass at the University of Wisconsin, Madison, leads a demonstration of using motion-mapping tools to accelerate skills acquisition in students. 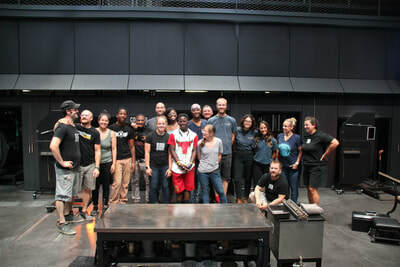 The Robert M. Minkoff Foundation salutes the seven students awarded an expenses-paid, week-long intensive educational experience at the Studio of The Corning Museum of Glass. 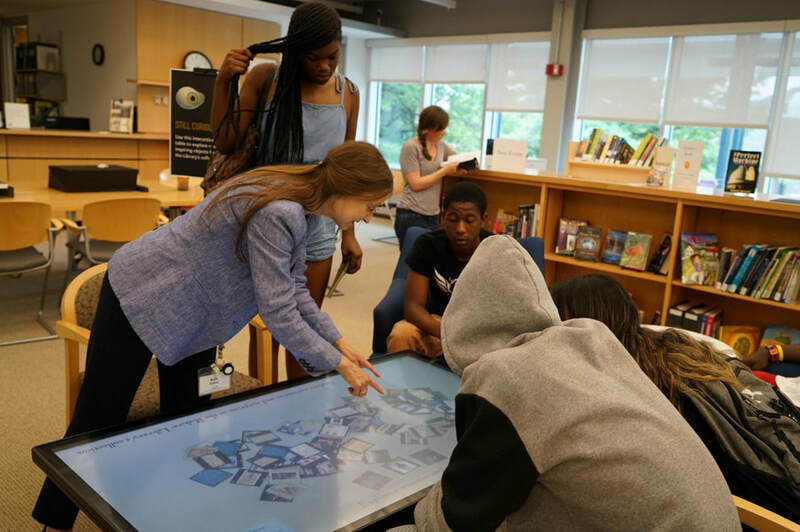 The Expanding Horizons program, a partnership between the Minkoff Foundation and the Studio at The Corning Museum, launched last year. 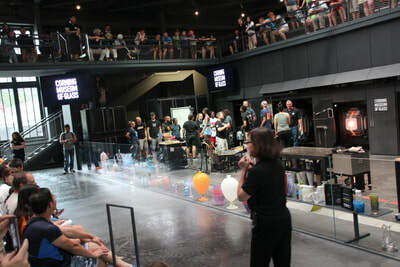 It's an annual event that seeks to identify the most-promising students of at-risk programs around the U.S., and to give them the opportunity to broaden their knowledge about the wider world of glass through studio courses, as well as meetings with the curators and research staff at The Corning Museum of Glass. The At-Risk Panel at the 2016 Glass Art Society Conference"Creating Context: Glass in a New Light" will discuss post-high-school opportunities for participants in programs that use glass as an educational tool to teach life lessons for youth considered underserved. Among the topics will be the Robert M. Minkoff Foundation's ongoing partnership with the Studio at The Corning Museum of Glass called Expanding Horizons, which seeks to identify the most-promising young artists in these programs and to provide a week-long all-expenses-paid program to broaden their perspective on the glass world. For the panel, which will be moderated by Minkoff Foundation director Andrew Page, Corning Studio director Amy Schwarz, GlassRoots executive director Barbara Heisler, Minkoff Foundation managing trustee Robert Minkoff, Ignite education programs director Tracy Kirchmann, and a participant in the 2015 Expanding Horizons program and a graduate of GlassRoots Hector Gonzales will discuss his or her programs and experiences, followed by a general discussion and then questions from the audience. The panel discussion will take place on Friday, June 10, 2016, from 3:30 PM to 5 PM at the Corning GAS Conference. Beauty Beyond Nature: The Glass Art of Paul Stankard has garnered two reviews on the online retailer Amazon.com, both at the top score of five stars. "Fantastic photos with close-up to give details. I love the book," writes one recent satisfied customer. Another reviewer seconded the unique perspective the book provides through the use of special high-magnification lenses which make the full extent of Stankard's accomplishments clear: "I particularly like the close-ups of some of the details in the glass work. The book itself is a thing of beauty. Lovely," he writes. To see the reviews in full, or to purchase the book, visit ﻿the listing on Amazon﻿. Expanding Horizons 2015 participants listen as Corning curator Kelly Conway discusses the museum's new Contemporary Wing. 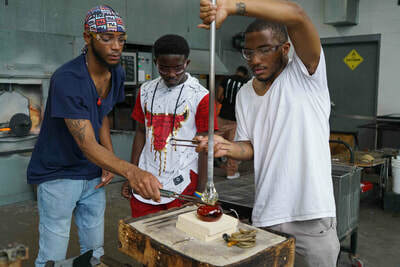 Offering talented high-school-student artists from underserved communities the opportunity to experience glass art at a new level, the Expanding Horizons program will return in 2016 for another week-long opportunity for the top-students in at-risk glass art programs around the U.S. to experience the wide world of glass art in depth. 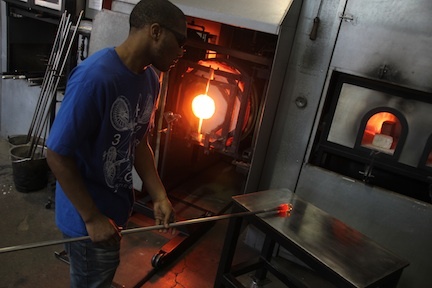 Taking place at the Studio of The Corning Museum of Glass from July 24 - 31, 2016, the program blends instruction at the state-of-the-art studio facilities with curator-led tours of the world's leading glass collections, meetings with head researchers at the Rakow Library, an informational session with the chief buyer from The Corning Museum store, a presentation on applying to colleges with a focus on glassblowing, and much more. For more information or to apply, please visit www.atriskglass.org/outreach. The deadline for applications is April 1, 2016. 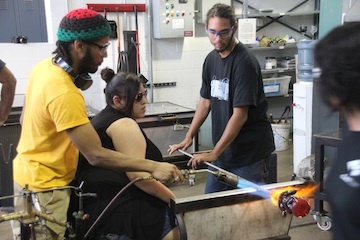 Ranch Hope students in the studio during the inaugural "Art & Glass Week" project. Now in session, the first "Art & Glass Week" is taking place at the Samuel H. Jones Glass Center at Salem Community College. Sponsored by the Robert M. Minkoff Foundation, the program is bringing a first flameworking experience to at-risk students from Ranch Hope, a nonprofit that provides intensive services to over 90 moderately, emotionally disturbed young men and women. The instructors include Dennis Breining, instructional chair of scientific glass technology at Salem Community College; artist Paul Stankard, an SCCC alumnus, and Douglas Ohm, who serves as the coordinator of the SCCC's glass instructional center. Running from August 24th through August 28th, the five-day program seeks to give students an opportunity to develop hand-skills and explore creative expression as they learn about all aspects of the flameworking process. 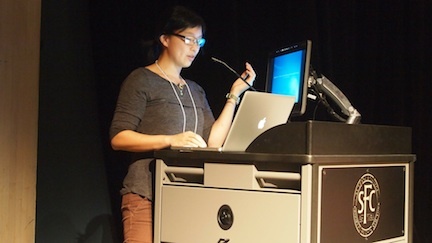 Helen Lee, head of the glass program at the University of Wisconsin, Madison presenting at the 2013 Robert M. Minkoff Academic Symposium at UrbanGlass. The 2013 Robert Minkoff Foundation Academic Symposium at UrbanGlass drew 100 glass department heads, faculty, administrators, and students from around the world to Brooklyn, New York, for three days of lectures, panel discussions, a tour of Manhattan galleries, and numerous opportunities to network with peers. Tina Aufiero, artistic director of Pilchuck and a mixed-media artist will deliver the keynote address. Graduate students from MIT's Media Lab will discuss a hot glass digital printer they developed with Peter Houk and his Glass Lab at the prestigious university. Glenn Cook, chief scientist at The Corning Museum of Glass, will deliver a presentation with Amy Schwartz, director of The Studio, about the new specialty glass residency where artists are invited to work with exotic formulations of glass in the Corning, Inc., archive. 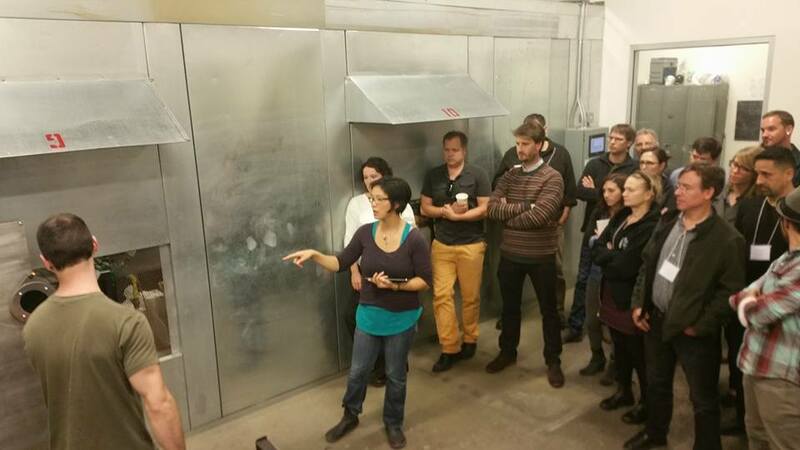 Helen Lee, head of glass at the University of Wisconsin, Madison, will talk about how multiple video cameras can provide accelerated skills acquisition in the glass studio. These are just a few of the notable presenters and presentations that will provide unique insights into the most important technologies emerging for use in the glass studio. With a gallery tour, panel discussions, receptions, and multiple opportunities to connect with leading educators in the field, the symposium is a unique opportunity to advance your understanding of the role of new technology in the field of glass education while networking with your peers. View the full program and register now and receive special discounted hotel rates reserved for symposium attendees. 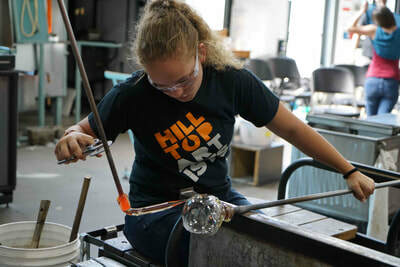 "Expanding Horizons," a week-long expenses-paid program at The Studio at The Corning Museum of Glass designed to help the most promising glass artists in at-risk youth programs, wraps up. Students in the 2015 Expanding Horizons Program pictured with The Studio's director Amy Schwartz and Minkoff Foundation's managing trustee Robert Minkoff. Running from July 19 - 26, 2015, the inaugural "Expanding Horizons" program, a partnership between the Robert M. Minkoff Foundation and The Studio at Corning, brought six students hailing from Watts, Los Angeles; Chicago; Newark, New Jersey; and Benton Harbor, Michigan, to the town of Corning, New York. Along with their mentors, high-school-aged students spent the week learning skills from the Studio's instructors, touring the world-class art collection with a museum curator, and hearing inside tips from the retail store buyer about selling your work — just a few of the events offered on the busy schedule. 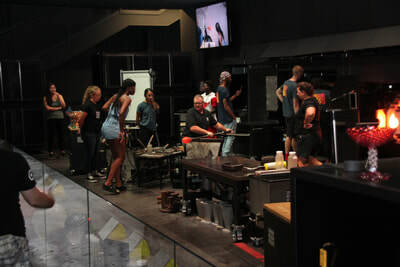 The multiple presentations to students were designed to broaden the students' awareness of what is possible in glass art and make them aware of the resources -- from the Rakow Library to the state-of-the-art facilities -- available to glass artists. The Robert M. Minkoff Foundation funds successful panel of at-risk youth programs at 2015 Glass Art Society conference in San Jose. For the second time, the Robert M. Minkoff Foundation paid for travel and lodgings of some attendees, and organized a panel discussion and luncheon networking session, to facilitate connections between at-risk youth programs that use glass art as a means to teach life lessons. With outstanding programs pursuing their initiatives on opposite coasts of the U.S., as well as throughout the country in cities like Chicago and Tulsa, there have been few opportunities for these program heads to learn from one another, share success stories, and leverage their experiences. On June 6, 2015, the executive directors of Hilltop Artists in Residence in Tacoma, Washington, and GlassRoots in Newark, New Jersey, joined representatives of programs in Chicago and Corning, New York, on stage at the 2015 Glass Art Society conference to discuss best practices. To make the most of the limited time, and unique opportunity to bring together leaders from this field, the panel divided up into breakout sessions, reconvening at the close of the panel discussion to share what transpired in each group. After the panel discussion, the Minkoff Foundation sponsored a luncheon where Nate Watson, executive director of Public Glass in San Francisco, shared the results of a collaborative project his at-risk kids completed with another cultural organization in San Jose. Read more here. 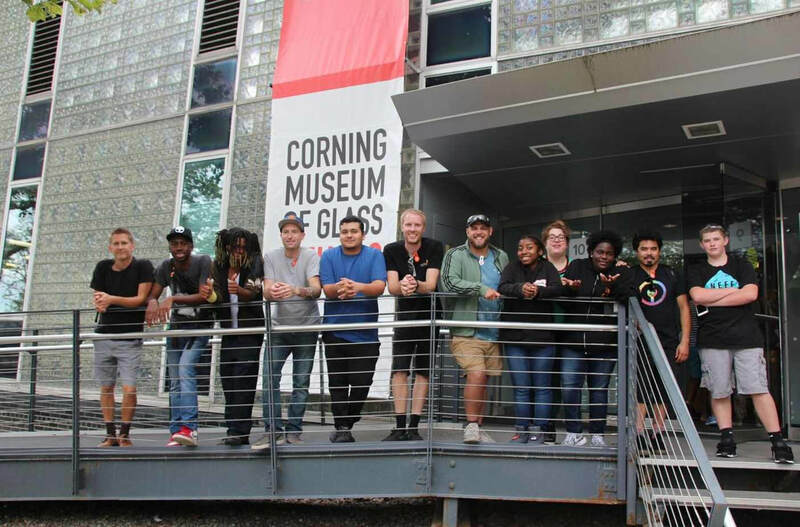 We salute the six students awarded an expenses-paid, week-long program for the most-promising students of at-risk programs that will take place at The Corning Museum of Glass in mid-July. More info here. In an episode that aired on Sunday, April 26, 2015, Paul Stankard was featured on this nationally broadcast program, resulting in brisk sales of the book Beauty Beyond Nature: The Glass Art of Paul Stankard, published by the Robert M. Minkoff Foundation and available for purchase here. 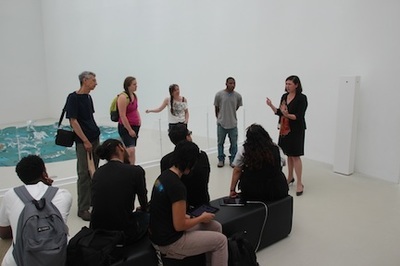 Artist and educator Sarah Gilbert, who was awarded the 2014 4Front Residency by the Robert M. Minkoff Foundation, in partnership with the Chrysler Museum of Art Glass Studio, returned to Norfolk, Virginia, where the work she made during her residency was put on exhibition in the studio's Vestibule Gallery from March 17 through April 12, 2015. She also presented a performance art piece in collaboration with Pato Herbert, on Thursday, March 18, 2015, in which, accompanied by a brass band, Gilbert involved the audience in various ways of interacting with objects made during the residency and those newly blown in front of the audience and used to burn paper. Photo sensitive paper was also used to record the images of objects. Involving the public in her art process is a central element in Gilbert's work, and the exhibition of work made during the residency encouraged members of the public to find elements of their bodies which they had made molds of alongside other individuals from various walks of life, all an effort to use art to make new connections across race, class, and cultural lines. The Minkoff Foundation partners with The Corning Museum of Glass Studio to offer week-long program for the most talented high-school artists from underserved communities. 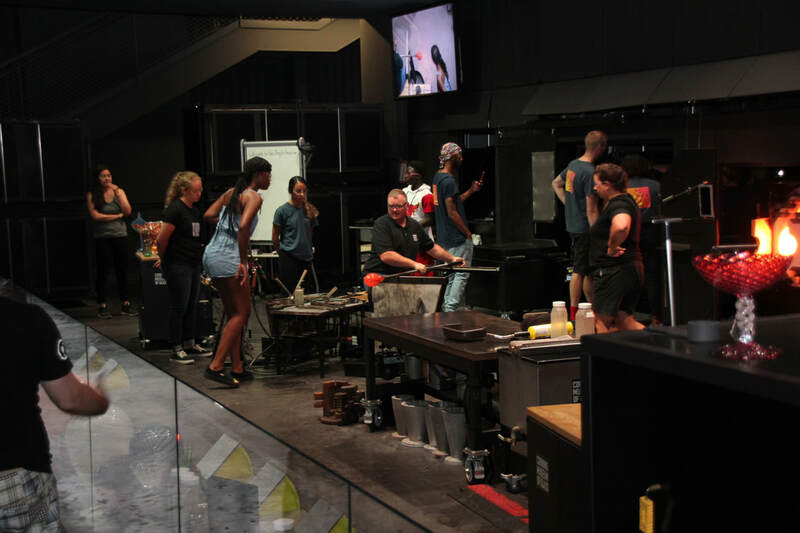 A six-day intensive program at the Studio of The Corning Museum of Glass aims to bring the top students in at-risk glass art programs around the United States for a perspective-changing experience of glass art. The outreach program includes airfare, lodgings, and meals for the duration (the program runs from July 19 - 26, 2015). 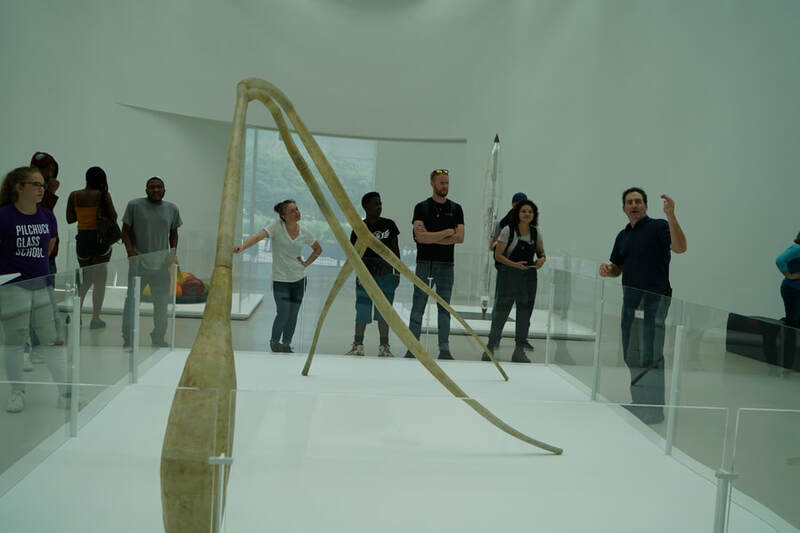 The itinerary blends instruction, touring the collections with curators, a visit to the Rakow research library, a meeting with a prominent collector, a discussion about preparing an artist's portfolio, and a presentation on applying to college with a focus on glassblowing. 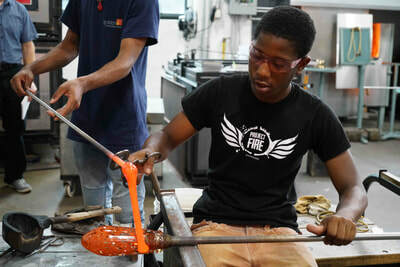 Further student’s technical knowledge of glassblowing as well as introduce other ways to work with glass such as kiln-forming and product design. Introduce professional practice standards for applications relating to job opportunities, scholarship, and education. 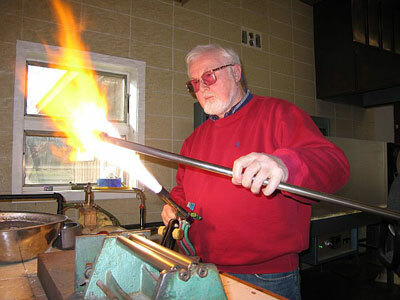 Provide students with education about the history of glassmaking, the science of glassmaking, and potential of glass as a medium of expression. The Bergstrom-Mahler Museum of Glass debuts "Beauty Beyond Nature: The Glass Art of Paul Stankard"
﻿Open through February 15, 2015, the Bergstrom-Mahler Museum of Glass in Neenah, Wisconsin, is exhibiting almost 70 works by artist Paul Stankard drawn from the Robert M. Minkoff collection. 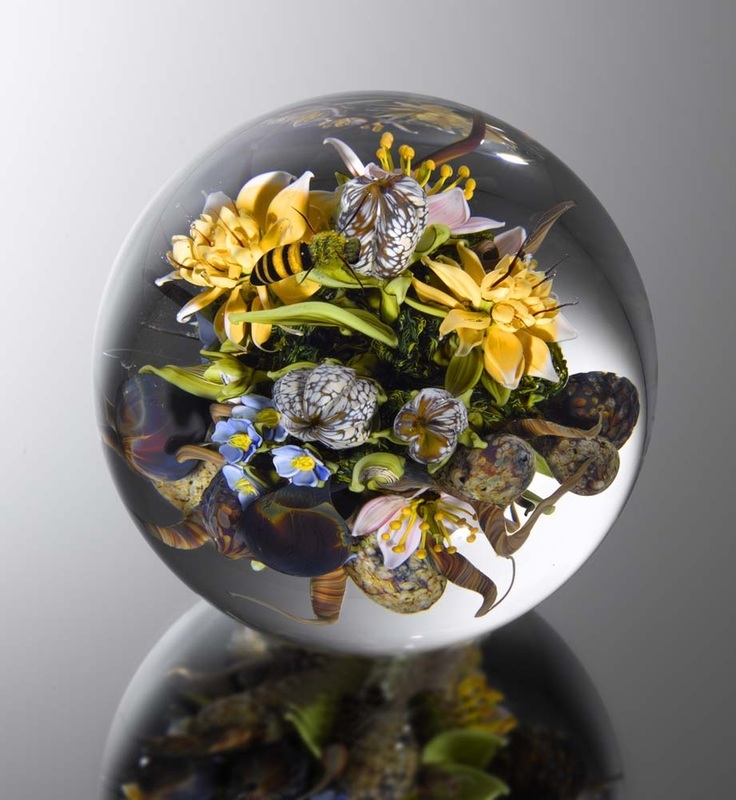 This retrospective exhibition traces the evolution of Stankard's botanical portraits in glass from his earliest attempts at paperweights to his innovative new encased forms that have expanded the scale and intricacy beyond anything that has preceded it. The exhibition is a testament to the power of a collector-artist relationship that has opened the world of glass art and the visionary advances of one artist to a broader audience through an exhibition that has traveled to several venues. A coffeetable book that documents Stankard's achievement published by the Foundation serves as the exhibit catalog. Robert M. Minkoff encountered Paul Stankard’s work in 2005 and, in a very brief period, built a definitive collection documenting the artist’s journey in glass, with examples of the key innovations that Stankard has pioneered in bringing the paperweight form out of its traditional small form factor and into triptychs, assemblages, and vertical presentations. The Bergstrom-Mahler exhibition will continue through February 15th, 2015, and a special weekend event is planned from October 10th through the 12th that will bring together art lovers and Ferrari collectors to celebrate great artistry. 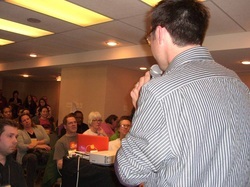 There will be presentations by Robert Minkoff Foundation managing trustee and foundation director Andrew Page. More information. 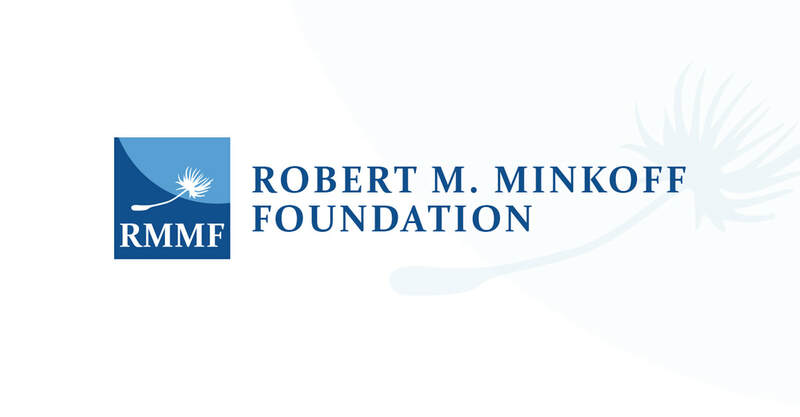 On Friday, March 21st, 2014, an At-Risk Youth Panel sponsored by the Robert M. Minkoff Foundation brought together representatives from the top programs from around the U.S. to talk about what they were doing and to share their perspective on what works. That evening, a reception at Little Black Pearl sponsored by the Minkoff Foundation celebrated the glass program at a public high school in the South Side of Chicago, offered further networking opportunities, and a joint exhibition of work by students of these programs around the U.S. You can listen to an audio transcript of the presentations on a Website the Minkoff Foundation has created to foster better connections and exchange between these programs at www.atriskglass.org. An open forum is available to continue the discussion of best practices and share the challenges and success of using glass education to change lives.